Over the last 100 years, senior managers of nonprofits typically have held the executive director title. For about the last 30 years, many nonprofits have changed the title to president/CEO, following a common business practice. Many more nonprofits need to consider the same change to obtain some subtle but useful organizational benefits. A recent study reports that only 22 percent of trade association chief staff officers hold the president/CEO title. For professional societies, the proportion is only 9 percent.1 Many chief staff officers in larger faith-based human service and health-related organizations still hold the executive director title. Even the senior manager of Carnegie Hall in New York City still carries the executive director title. minimize audience perceptions of the contributions of their organizations. Using the title of executive director made sense during the early part of the 20th century when nonprofit organizations were modest ones with a handful of employees, and volunteers regularly filled managerial or service roles. As late as the 1960s, one occasionally witnessed volunteer board members having internal operational roles. Those who advocate for the continued use of the executive director title argue that use of the title is empirical evidence of board involvement in the activities of the organization. However, the negative side of the argument is that continued use of the title leads to board micromanagement of operations, which stunts organizational growth. Nonprofit organizations became larger and more complex in the latter part of the 20th century. Local professional societies became regional organizations; hospitals became regional healthcare systems; and so on. The proportion of volunteers involved in management operations and staff work declined. Consequently the trend to use the president/CEO title became more appealing to focus operational responsibility on management and staff. If properly structured, the title requires the chair and CEO to develop a more trusting professional relationship and assures the stakeholders of higher levels of performance. Organization results become focused on outcomes, not process. In the latter part of the 20th century, business organizations began to add the title of CEO to the title of either their president position or board chair position.3 The objective was to clearly designate which of the two had final operational authority, except for those actions which are reserved by the firm’s bylaws for the board (usually acquisitions, pension plans, and long-term contracts). In the business environment, as contrasted to the nonprofit environment, both the chair and the president can be corporation employees. Share your thoughts. Choose the appropriate survey from below. Surveys are quick, and responses are anonymous. I am a board director or trustee: Go to survey. Then, view results. I am a CEO or executive director: Go to survey. Then, view results. About 1980, nonprofit organizations began to mirror business organizations managerially. Many developed marketing departments, installed complex information technology, and a few even hired experienced business executives to head their organizations. The older philosophy, listed above, of “avoiding the businesses connection” was quickly being eroded. Today, specialized programs operated by many associations prepare aspiring nonprofit executives to advance through managerial positions to presidential positions. Nonprofit boards, after 1980, when hiring new senior managers, offered titles of president/CEO4 and made bylaw provisions for other persons in the senior management teams to become vice presidents. Nonprofit board chairs can do their job well without final CEO operating authority. Traditionally, chairs are volunteer personnel who should focus board activities on strategic issues not operational concerns. Some president/CEOs even became voting members of their boards, if permitted by their state laws. It was not unusual for some incumbent executive directors to seek the new title, if it was politically expedient. However, many conservative boards still look upon the change as a managerial power grab, which evidently has slowed the change process. Nearly three decades have passed since the early adopters made the first changes. Yet, as indicated before, there are still thousands of complex nonprofits operationally headed by managers holding the executive director title, although these persons may have robust and complex operational duties. Read the original article, which prompted Eugene Fram’s response. A nonprofit operating head with a president/CEO title can more easily help focus on building the public brand image of the organization through his or her force of personality and the clear perception of who is leading the organization’s mission. She or he should be in the best position to staff the “bully pulpit” for the mission of the organization. Staff discipline and morale may also be compromised when the executive director title is employed. In local or regionally based nonprofit groups, staff members often are personal friends of their board members. It is not unusual to have disaffected staff personnel directly complain to the board when they disagree with one or more of management’s operational or human resource decision.5 It can be hypothesized that some of these cases may have their roots in a lack of understanding of the role of the executive director and who has final operational authority in the organization. Also, the senior manager from time to time may have opportunities to be interviewed by the media. This can be a critical responsibility when a rapid response to a crisis is needed or an unusual public relations opportunity arises. Consequently, the president/CEO title enables him or her to move quickly and authoritatively; there is no ambiguity related to the leader’s authority. How leaders and organizations are perceived by stakeholders are realities with which leaders must deal, whether or not the perceptions are accurate. Providing the chief staff officer with the president/CEO title can help develop more desirable internal and external perceptions of the strength of an organization and the responsibilities of the person leading it. Organizations which make the title change quite often do so in connection with developing a structure that brings more formality and managerial professionalism to the culture. In the past, years of volunteer involvement in operations often developed a more family culture which is a positive force when the nonprofit is in its early stages. But it is hard to maintain a family environment as the number of employees grows. A new formality, brought about with the senior manger’s title change along with a group of former managers now titled vice presidents, may be seen by older members of the staff as making the operation “uncaring” towards staff and clients. As time progresses, with the president/CEO being the communications nexus between the board and staff, there will be less personal contact between the two groups This requires the CEO to be concerned that a mistrusting atmosphere may develop. Under his or her guidance, contact between the board and staff can take place on ad hoc committees, on strategic planning projects, at various board orientations, and at organization celebrations. In these ways, the board can seek the participation and advice of all staff in establishing the major programs involved with missions, visions, and values. If managed properly, the change in top titles and the greater formality it can bring may raise some trust issues with older staff.6 However, management needs to convey a message to the staff that the change is a result of the board placing more trust for operations in the hands of management and staff. Some nonprofits take the position that fund development is the responsibility of the board, since board members have the broadest range of community and other outside contacts. With a president/CEO in the top management position, fund development becomes the joint responsibility of the president/CEO, the development person—if one is employed—and board members capable of fundraising. The new title gives the senior manager the immediate recognition necessary to credibly approach donors and, with the consent of the board, to make commitments on behalf of the organization. To involve the board more directly, the president/CEO can work collaboratively with board members to develop contacts opened by the board. (As one nonprofit executive person explained the situation, “Top people readily communicate with persons in similar positions.”) In seeking support funds, the new title can open doors and communications that might not be available to one holding an executive director title because the title conveys such an unspecified range of responsibility. It might, per se, even raise an unarticulated question in the minds of some donors as to why the person has not been given the title of president/CEO to clearly demonstrate his or her operating authority. Compared to the duties of a president/CEO, the duties of an executive director range much more widely on a management activity scale. Some executive directors are simply clericals while others are sophisticated senior executives. Any organization that ignores this fact can leave a psychological gap in public perceptions relating to the group’s strategic posture and the senior manager as a substantial leader. Where warranted by higher responsibility levels, changing a senior manager’s title to president/CEO can help present a better public posture for the senior executive and a better strategic posture for an organization. 1. Mark Alcorn, “Evolving Titles for Association Executives,” Articles & Whitepapers, ASAE, September 2006. 2. See http://en.wikipedia.org/wiki/Executive_director. Non-executive directors are volunteers who mentor or advise an operating division within the nonprofit, such as the development office. 3. In the nonprofit corporation, the board chair is usually an unpaid volunteer who also might hold the CEO title, indicating that person has final operational authority. 4. Eugene Fram, “Changing Expectations for Third Sector Executives,” Human Resource Management, Fall 1980, pp. 8-15. Eugene Fram with Vicki Brown, Policy vs. Paper Clips: Selling the corporate model to your nonprofit board, 1988. 1st edition, 1995, 2nd edition, Families International, Milwaukee, 3rd Edition Policy vs Paper Clips: How using the corporate model makes a nonprofit board more efficiency & effective, Create Space, March, 2011. 5. 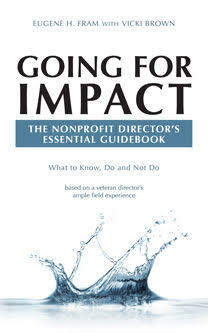 This action is often called an “end run” by nonprofit managers. 6. This also assumes that those directly reporting to the president/CEO are concurrently given vice president titles.